Are you in search of the one of the most famous, developed and vibrant spots in the United States right now? Moving to the Bay Area is a great option to achieve new professional and personal goals for many people. Living in the Bay Area means to face cosmopolitan reality – it is very diverse, ambitious and yet in some way very relaxing and peaceful. Our Bay Area moving company has prepared a lot of useful information to consider before moving. San Francisco combines stunning landscapes and modern metropolitan issues – overcrowded streets, high prices, traffic problems. The city has experienced population growth of almost 8% for the last 10 years– today San Francisco has a population of 880 000 residents. What is very interesting about the population in the Bay area is the percentage of residents which are U.S citizens is only 85%. The Bay area is a very popular destination for newcomers. Every year the population of major cities constantly grows. The place becomes more and more ethnically diverse. 35% of residents are Asian and Hispanic race. The median household income across the Bay Area is $95,159. Middle-class income could be very different – from $60,167 to $194,500. The unemployment rate is very low – only 3%. The Bay Area is a region with the most educated population in the United States. 35% of residents have at least a bachelor degree. The climate is very mild and warm for most of the year. Sometimes people here experience foggy days and cool mornings – just a few weeks per year. It is not a secret that San Francisco has the richest job market in the United States, and probably in the whole world. Many young professionals come to seek a job in big innovative companies or even create opportunities to work for others making a startup. Obviously, the Bay area is a great place for those who is looking for career options. The most common industries with excellent employment options in San Francisco are computer science, management, business and financials, sales occupations, arts, design and media, social sciences, healthcare. The people who making more than $100 000 per year are considered as those who are living above average standard. 27% of residents works in management industry; education, computer and mathematical occupations – 12%. 60% of the Bay Area residents choose to work in San Francisco, 25% working outside the city. High tech innovation is the first mental image many people would have when they hear about the Bay Area or San Francisco. And it is completely justified. The place is actually on top of the world in designing devices for everyday life – innovative technologies developed and presented here are used basically in every corner of the planet. San Francisco has the largest center in the whole country for the high technology industry. San Francisco simply values educated workers in every area. Let’s start with a fact that there are over 7000 college degree residents per square mile. Amazing numbers which are very hard to find in other cities. So it is not a coincidence that there are great education facilities in the Bay Area. At least two of them have been listed as top in the world – Stanford University and Berkeley. Besides that, it is worth to note the fact, that 60 Nobel Prize winners are residents of the one or another part of the Bay Area. What attracts people to move to the Bay area is its average salary which are $87, 130. San Francisco has the highest paying jobs in the country. It goes without saying that San Francisco is one of the most convenient places for walking in the whole country. Nevertheless, public transportation is widely presented in the whole city. There are several big bus companies, Caltrain, very comfortable Bay Area Rapid Transit or just BART, San Francisco Bay Ferry, AC Transit, Golden Gate Transit, Samtransit and, of course, cabs. Practically, all the locations around San Francisco are easily accessible. The nearest commercial airports also located in the close proximity to the city. This city is one of the best bike-friendly places in the United States. Some residents choose to bike to work instead of using a car. There are several bike communities, the most famous one is the “San Francisco Bay coalition”. Maybe you’ll be surprised to learn the next thing, but due to job opportunities and professional positions in the tech industry, average residents’ age is 36 years old. Since job positions in the Bay area attract young professionals, most San Francisco’s residents’ age is somewhere in between 25 to 45. The people here admire a great nature around. There is a considerable number of hills, recreation areas, wine country and lakes. There are 3,424 acres of recreation space – big enough for any physical activity you like. Just a few hours of driving you can visit Yosemite National Park or beautiful Lake Tahoe. You can also hike, ride the bike in beautiful nature and experience amazing things without even leaving the city. San Francisco is home to many art facilities. Not to mention that place is an art by itself, you must note that here you can see hundreds of world class artworks and performances from legendary artists. Movies, paintings, books and magazines – all of this is essential for the city. It would be truly hard to count how many possibilities to spend your time with excitement and fun San Francisco has to offer. The Bay area is considered to be one of the biggest cultural centers in the whole country. Everything from live music concerts, art exhibitions and performances to wine tasting at Napa County. San Francisco has a vivid, vibrant life – plenty of cuisines, entertainment hubs, historic landmarks and tourist attractions, local events and must-see places. Despite all the beautiful sides of the Bay area the place simply can’t avoid common metropolitan issues – overcrowded public spaces. Population density increases every year, and some people convinced that today this tendency already is out of control. This problem reflects the previous one. San Francisco paralyzed with traffic. Even though public transportation packed with people, it still doesn’t help. According to recent surveys on traffic data, San Francisco has the second worst traffic in the United States. One good advice for those who move here is to try to avoid having a car. If you are about to move to the Bay Area and you still don’t know how expansive the city is, prepare yourself to a big surprise. An income you need to have for a comfortable life here is $110 000. Obviously, most of the people simply can’t earn so much. That is why living in San Francisco for many people rather not very satisfying. Some of them even in the age of 35-40 have to live with roommates to afford the place. The median rent for a one-bedroom is $3, 350. The median home price is $ 1,5 million. The average cost of living in the Bay Area for the four-person family would be $ 4,180 without rent. The reason why the city has such bad traffic and become so car-dependent is its rather disappointing transit system. In spite of the fact, that public transportation presented by many and many companies, it does not always work that good. If we are talking about transit systems in the area there are still problems with safety and functions. The crime rate is unexpectedly high. San Francisco has a tendency to suffer from violent crimes. It is 60% higher than generally in California and 85% higher than averagely in the whole country. If these numbers amazed you, listen to this: the level of property crimes in the Bay area is 145% higher than generally in the United States. San Francisco is number one in property crimes among the biggest United States cities. The income difference between rich people and the middle class is devastating – almost $500 000. There is no reason to expect that the situation will be better over time. On the contrary, as the experts predict, the gap will grow. Some residents regret moving to the Bay area. 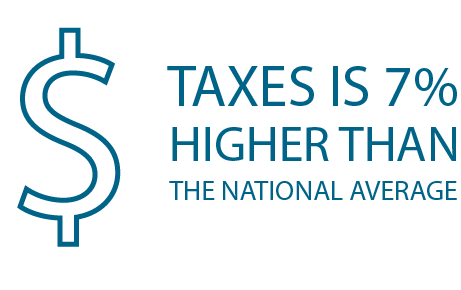 Well, there are could be several reasons for that, but most likely it is all about discouraging personal income taxes. In the state of California, taxes system is frustrating. It is 7% higher than the national average. Residents in San Francisco have to pay almost 40% of their income only on taxes. San Francisco has a large group of homeless people. The residents have over years of familiarization with all the habits that may be a part of homelessness – sleeping on sidewalks, public drug use, or even aggressive behavior to passers-by. Local government try to solve the problem but it seems not very effective so far. This city is a great place for adult life, but not that easy to raise children. If you want your child go to a school near home, you should rely on a bit of luck. San Francisco Unified School District has quite a weird system and usually sends students to different places all over the city. There is no much of a chance that your child’s school will be in close proximity to home. Of course, there is always a possibility to study in a private school, but those are very expansive and have a limited number of students. The list of pros and cons of living in the Bay Area could be longer, but the simple truth is that you do not have necessarily live in the city to enjoy its advantages. Besides, if you want to have affordable living in the Bay Area the easiest way to do that is to reside outside San Francisco. Let’s take a survey on the best counties to live in the Bay area. Marin County – the smallest and maybe the most beautiful county in the Bay Area. Surrounded by nature of all kinds – hills, waterfalls, forests and even canyons. It’s a few times cheaper to live here than in San Francisco, which is, by the way, only 40 minutes away from. The county has a rural atmosphere and a bunch of nice small cities. Mill Valley is one of the most distinguished in the county. The unemployment rate is only 1%, there are many public and private schools. The crime rate in Marin County is 50% lower than the national average. If you want to know where to live in the Bay Area with a comfort, consider also the city of Tiburon. Many of those who work in San Francisco took the advice to move to the cities like Tiburon or Mill Valley and become satisfied with a new place of living. Another great destination for those who want to dwell in the Bay Area is San Mateo County. Only 20 miles from San Francisco by car driving. Especially great advice for newcomers is to take a look at the city of Hillsborough. The place with a very low crime rate and high paying jobs. The city of Hillsborough is a home for highly educated residents. Most of them have an income of $115 000. Apparently, these numbers affect the median home and rent prices – which are $4,443,300 and $3, 250 so far. Napa County – well-known for its wine, it is also a great place to settle in. The place with an agricultural environment and old local traditions. It is much cheaper to buy a house in the area – the median home price is $679 400. The average rent for an apartment in the Napa is $2,000. The crime rent, on the other hand, is quite alarming – 40% higher than in other cities and towns in the United States. The distance to San Francisco is 60 miles. 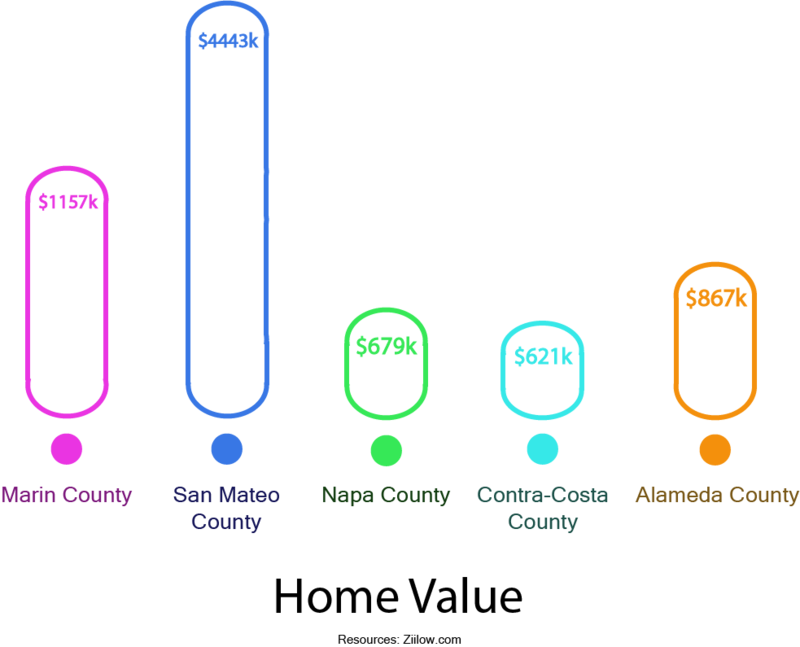 Contra-Costa County– a part of the East Bay area. The County is full of natural landmarks – valleys, hills, peaks and mountains all over the place. For example, consider the city of San Ramon – the place with the low unemployment rate, high level of safety and just great city for those who admire golf. One of the best places to live in the Bay Area. 70 minutes of car driving to San Francisco. Alameda Countyalso has many wonderful cities with a calm atmosphere and good career possibilities. Well-known as home to one of the most successful Universities in the world – UC Berkeley. The County located on the East Bay region. Many people choose to live in some smaller towns. The County situated in an hour of driving from San Francisco. The median home price is $867 000; the median rent is $2600. For over decades the Bay Area has been a home for innovative technologies that run the world. But it is not all that the place has to offer. Besides high-tech companies and industries they are related to, there are other great places to work. We have listed some of the best companies to work for if you move to the Bay Area. We won’t say about companies like Facebook or Google and take a survey on other job possibilities in the Bay Area. Besides for the innovation, well-developed industries are management, information technology, marketing. Kimpton Hotels & Restaurants– the company has developed a strong sense of community inside it. The employer offers professional training, good payment and health insurance. The company also have a great support structure for newcomers as well as for old workers. 95% of workers are proud of the service the company provide. McKinsey & Company – is a global management counseling company. According to the reviews, the company is very trustful, has a great learning curve and career possibilities. The brand has great recognition in the world and satisfying consulting toolkit for workers. Travelers – insurance company for real estate, auto and business. Almost every year according to different charts the Travelers company become either the best company to work for. One of the most generously paying companies due to reviews of those who use to work there. Salesforce – one of the largest companies in the Bay Area. This is the cloud-based software company with more than 17 000 United States workers. 90% of employees say that the company is a great place to work with satisfying payment. Considered as the best workplace for millennials. Zillow group – a famous real estate database company with great results and feedback from clients. The company’s focus is all kinds of real estate services – from renting to buying apartments. Every year the company has one of the leading positions in their professional area. Most of the workers, which is 94%, claim that this job was a positive career experience. Do you need moving help? California Movers works all over the West of U.S. serving local and long distance moves.